F2 is back on sky and available for queue observations. The OIWFS is fully operational. F2 is not available until March 29. The filter and grism mechanisms are being refurbished at the instrument laboratory in Cerro Pachon. F2 OIWFS is repaired and being offered in shared-risk mode for a few queue programs. Please consult your CS in case your observations cannot be performed with the PWFS2. F2 OIWFS is not available for guiding because of a mechanical failure in the probe arm. Please consult with your program contact scientist if the science outcome is affected by the PWFS2 vignetting outside a radius of 2 arminutes. If that is the case your observations will be kept with on-hold status until the next instrument shutdown allows to solve the problem, date TBD. F2 OIWFS is available for science observations requiring image quality within the IQ 85%-ile. PIs with active programs in the queue can migrate the guider from the PWFS2 to the OIWFS. Please consult with your program contact scientist about the convenience of doing so. F2 is back on the telescope after a succesful completion of the shutdown; the instrument is available for imaging and long slit spectroscopy. Wave front sensing is only performed with the PWFS2, until the OIWFS on-sky characterization is completed. F2 will be not available during the period April 6 through April 27. There will be an instrument stand-down to perform inspection, repairs and maintenance tasks in the MOS wheel and OIWFS subsystems. During this shutdown commissioning MOS masks and the K2F2 filters will be also installed. Two medium band filters splitting the K-band (1.9-2.5 μm) will be offered in shared risk mode for the semester 2017B. The filters have been received at Gemini and are part of the K2F2 project, a Small Project for Instrument Upgrade awarded funds in 2016. After the filters characterisation is started the transmission curves will be posted at the instrument webpages. F2 OIWFS is available for science observations requiring image quality within the IQ 85%-ile. PIs with active programs in the queue can migrate the guider from the PWFS2 to the OIWFS. Please consult with your program contact scientist about the convenience of doing so. More work is planned until achieving an image quality performance similar to that offered with the use of the PWFS2. The current plan is to complete OIWFS tests on sky during February 2017. Until further notice the OIWFS is not available for queue observations. F2 OIWFS is not available due to a fault in its base mechanism. The current plan is to repair it during the next instrument shutdown in December 2-15 and test it on sky by February 2017. Until further notice the OIWFS is not available for queue observations. F2 OIWFS is available for science observations requiring image quality within the IQ 85%-ile. PIs with active programs in the queue can migrate the guider from the PWFS2 to the OIWFS. F2 OIWFS is not yet available, image quality and performance tests will be executed on the telescope when weather conditions and queue priorities allow. F2 is back on the telescope after a succesful completion of the shutdown; the instrument is available for imaging and long slit spectroscopy. The cryocoolers were replaced, maintenance work was performed in the electronics and mechanisms. The OIWFS was repaired and tested at room temperature. Further image quality and performance tests will resume on the telescope when weather conditions and queue priorities allow. F2 will not be available from April 30 through May 29, maintenance tasks and OIWFS repairs will take place in the CP laboratory. F2 MOS intervention in the laboratory is planned for the semester 2016A, in order to fix the OIWFS probe arm mechanism. After this repair is done, MOS commissioning will be pursued. All F2 guiding will continue to be done with the PWFS2. A K broad band filter is available for moderate resolution spectroscopy with the R~3000 grism. This "K-long" filter has central wavelength at 2.2 microns and bandpass 1.9-2.5 microns. The OIWFS probe arm is currently stuck out of the beam, and its repairment requires the instrument to be taken out of the telescope for two weeks, including the warm-up and cool-down cycle. F2 shutdown will take place during the next semester, and only after GMOS shutdown for fixing the detector problems. All F2 guiding will be done with the PWFS2 until further notice. In March, F-2 was off the telescope for two weeks for gate valve baffle system repairs, general maintenance tasks, and small upgrades. HK background has now returned to its historical values. The OIWFS is close to the PWFS2 performance, and observations requiring it are now being queued. The OIWFS use is restricted to those observations that cannot be executed with the PWFS2. The F2 OIWFS is currently in its last stages of commissioning. It is expected to be available during 2015A, but targets with RA<10h may be observed with the PWFS2. F2 programs contact scientists will asses the options for those 2015A programs requiring unvignetted fields with a diameter larger than 4 arcmin. After an F2 shutdown for repairing the decker wheel mechanism, the HK background was found to be much higher than normal. Routine instrument checks showed a large change in the distribution and level of the background. Due to a mechanical problem in the gate valve baffle there is a leak of thermal radiation and a relatively stable ghost affects the HK1200 spectra within the spectral range 1.25-1.70 microns. The feature is removable with the sky subtraction but leaves the shot noise residual in the cleaned spectra of targets fainter than 15th H magnitude. The impact is less significant on the K-band spectra and Ks imaging, which show some evidence of an increase in background within the level of the sky brightness in the worst case so far detected. Plans are being made for correcting this problem, and in the meantime the PI's of the affected programs are being contacted. The remaining configurations are not affected (Y/J/H imaging and JH/Y/J/H spectroscopy). We observed an erratic behaviour in the decker wheel of Flamingos-2 during last week. The mechanism failed completely during troubleshooting checks on June 17. We are planning to start a 2 week long shutdown of Flamingos-2 in order to fix this mechanism. The work will start by Monday 23rd. In the meantime, the instrument can only be used in imaging mode. After the remediation work performed on the Flamingos-2 camera, its image quality has greatly improved. It now delivers a failry constant fwhm (~ 0.36 arcsec) across its field of view. Spectroscopy is still an issue: a chromatic aberration is affecting the spectral resolution significantly toward the edges of the spectrum. Optical modelling will be needed to first understand this effect and next to plan how to solve it. In the meantime, Flamingos-2 is back on the telescope for science observations. The next step is to fully commision the OIWFS. At this time, the OIWFS can be used to guide and provide focus and tip/tilt corrections. However, the OIWFS can not provide reliable astigmatism corrections. We are planning to check the OIWFS performance on the sky within the next week. After that we plan to offer the OIWFS (limited to focus and tip/tilt corrections) for imaging and spectroscopic observations. As soon as the availability of resources and the weather cooperate, we plan to complete the OIWFS commissioining. At present, Gemini plans to have both GPI and GEMs installed on the telescope. As a result, Flamingos-2 will need to be taken out the telescope. We are using this opportunity to perform a remediation work of the camera. At the end of this work we expect to at least understand why the image quality of the instrument is not meeting the specifications. Our plan includes enough time to allow us to fix the camera optics if we are able to quickly diagnose the reason for the current image quality. The plan contemplates to go back on ths sky by May 20th. During the week of March 10th we discovered a problem with the OIWFS. Some of the SDSU controller boards have been damaged by condensation during the summer. Several boards have been replaced and the OIWFS is being checked. We expect to re-start the OIWFS commissioning work once we are back on the sky by May 20th. The OIWFS has not been offered yet. We plan to commission it during February. We suggest 2014A PIs with targets early in the semester plan to guide with the PWFS2 instead. Please be aware that Flamingos-2 is scheduled to be off the telescope by March 11th. It will be installed back by May 20th. So please plan to prioritize your targets accordingly. We have implemented a mid-term solution to the Lyot wheel problem. The initial temporal solution worked well but added some overhead to the observations. This is no longer the case. However, we would like to suggest to the PIs to notify us if they think that the throughput is different than what they would expect. We are in the process of acquiring a new K filter that will extend to 2.5microns. This filter would be used with the R3K filter in the near future (14B). Finally, work is underway trying to identify the physical mechanism that has caused the camera IQ degradation. Once we identify the reason we will propose a plan for fixing it. In this way, we can recover the original spectral resolution and also start the commissioning of the MOS mode. On the night of October 14th, we discovered a sudden drop in flux from GCAL flats and arcs (as much as 90%). We have tracked down this issue to the fact that any motion of any of the two filter wheels could potentially drag the Lyot wheel. So it is possible that observations might have been vignetted (some 10% - 30%) by the Lyot wheel. The vignetting should not have been more severe than this or else we would have detected it in the GCAL flats and arcs. At this point, we have a temporary work around that allows us to continue observations without affecting the quality of the data. We have made a preliminary assessment of the possible vignetting for the programs observed so far. In the next few days, we will notify the PIs of our findings. In the meantime, we suggest PIs to check the the GCAL flats and arcs. These calibrations are always taken either before or after the on-sky data and without needing to move the filter wheels. Therefore, they can be used to determine if there is an unexpected drop in throughput in the on-the-sky observations. In the following GCAL Flats and Arcs link , we provide plots for GCAL flats obtained under nominal conditions (no vignetting). During the last on-sky checks of FLAMINGOS-2 on the night of August 24th we detected an alignment problem with the On-Instrument Wave Front Sensor (OIWFS). 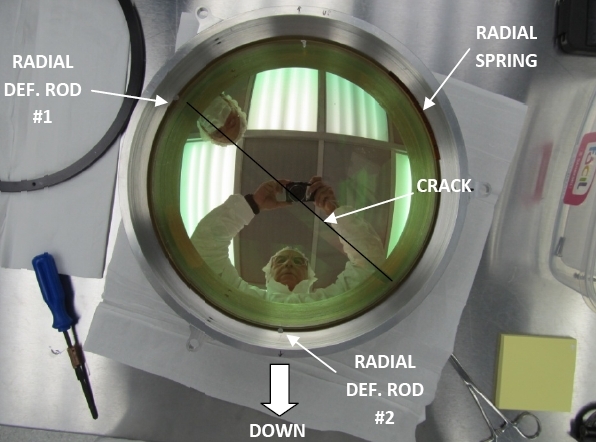 The mechanism was inspected this week without significantly disassembling the optics. Unfortunately, we were not able to identify the opto-mechanical cause of the misalignment. In the interest of getting F2 back into operations quickly and given the possibility of using the Peripheral Wave-Front Sensor (PWFS2) as a back up, it was decided to re-align the mechanism as best as it was possible in this short time. A more detailed analysis has been postponed for a later time when we can assign enough resources and better plan for this task. The PIs who could be directly affected by this issue are being notified by email. PIs with spectroscopic observations will have a choice to schedule their observations starting next week with the PWFS2 or waiting for us to get the OIWFS ready for sky observations later this month. We suggest that PIs with imaging observations wait until we can test the OIWFS before switching their programs to use the PWFS2. Last week we completed the last commissioning run of 2013A. We had a mix of very good and bad weather. We made good use of the good weather and left the instrument almost ready to start queue observations. This is a list of the main work done during the commissioning run. We completed the commissoning of the imaging mode. We verified that under excelent and stable natural seeing conditions (fwhm in K ~ 0.35 arcsec) the instrument delivers the IQ performance obtained in the lab. Note that this includes degradation of image quality at the edge of the field. We also obtained new photometric observations that will allow us to update the throughput measurements for the instrument. The change is very small ~ 2%. We obtained spectrophotometric observations that will allow us to verify the throughput for the spectroscopy mode. Moreover, we will also derive new models for the ITC that will be uploaded for the next observing season. We completed the commissioning of the 2-pix slit for different types of objects and instrument settings. We have derived new GCAL and comparison arc calibration tables that will be updated on the OT smartcal tables in time for the next ODB release. We will also upload them on the web. We have also analyzed data that suggests that spectroscopic GCAL flats and arcs should be taken at night. Also we suggest taking night time calibrations for every one hour of observations. We will update the public webpages and the ODB with this info shortly. The on-instrument wavefront sensor (OIWFS) fast guiding is not currently delivering optimal corrections, due in part to a hardware problem with the OIWFS electronics. Work continues to correct this problem. The impact on IQ=85 percentile observations is not critical, but it does affect performance under better (IQ=20% and IQ=70%) conditions. Last week we completed the most recent commissioning run. As we expect this time of the year, the weather did not cooperate and we had a mix of poor seeing and clouds. So we concentrated on commissioning the longslit spectroscopic mode and tuning the active optics corrections of the OIWFS. The instrument performed very well during this run without any issues. The following is a summary of the work done during the run. 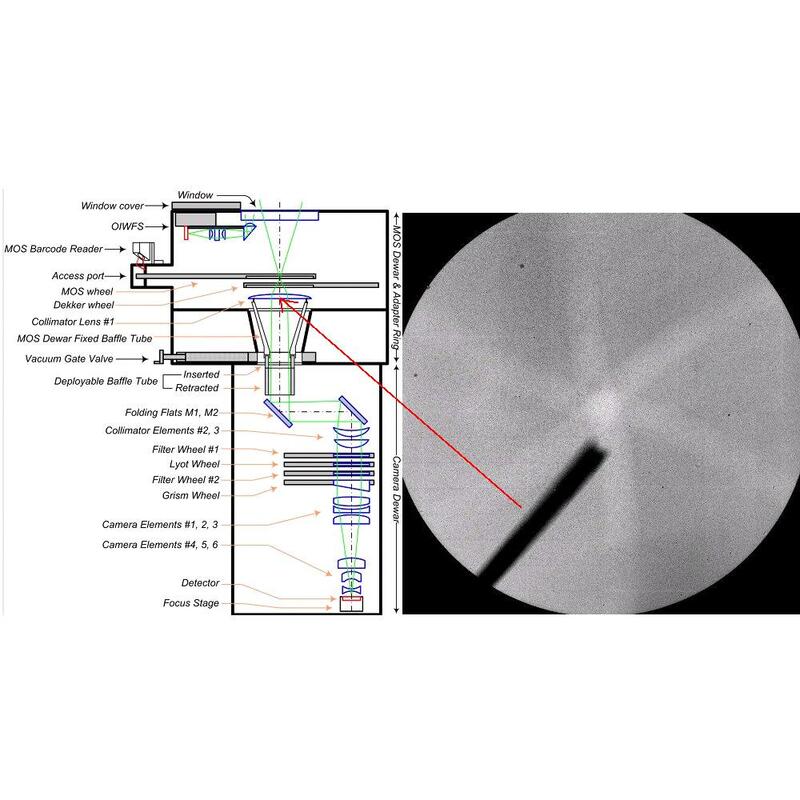 We obtained R3K + J, H, and Ks long-slit (3-pix slit) spectroscopy of extended objects. These observations were used to check the performance of the refurnished R3K grism that suffered some damage earlier this year. See below the 2-d spectrum of the galaxy NGC 253 obtained with the R3K + Ks. We continue the work on the OIWFS. The OIWFS is used to provide focus, tip-tilt, and astigmatism corrections. The focus and tip-tilt are performing adequately. The work left consists on tuning the astigmatism corrections that are used to adjust the figure of the primary mirror. This work is ongoing. We obtained out of focus images of an on-axis star in order to verify the alignment of the Lyot stop and to check that there is no vignetting. FLAMINGOS-2 moved another step closer to its final round of commissioning observations when it was moved from the summit instrument lab to the port 5 in the Instrument Support Structure (ISS) of the telescope in June 10th, 2013. For the past month-and-a-half F2 underwent work on the summit of Cerro Pachón to address repeatability problems with the multi-object spectroscopy wheel mechanism. This and other systems checked out successfully, leading to the installation of F2 on the telescope. F2 will start its on-sky commissioning on June 20, 2013. We have just completed the most recent commissioning run with F2. During most of the run we had bad and very bad seeing in the 1 to 4 arcsec interval in Ks. We had a brief period of good seeing (~0.6 in Ks for a couple of hours on the night of 4/29). Overall, we made progress on the commissioning plan taking full advantage of weather conditions that normally would have been considered "weather loss." Unfortunately, the MOS wheel started to behave erratically during the 5th night of the 6 night run. We were able to continue the commissioning by manually moving the MOS wheel to different positions. In addition, we found that the gate valve baffle, used to minimize the internal background, was slightly misaligned. We are currently warming up the MOS dewar and check this mechanism to ascertain the nature of this fault and fix it. In parallel, we are also warming up the camera to realign the gate valve baffle in order to carry out the commissioning of faint objects. Despite the seeing conditions, we performed several commissioning tasks that could be checked out from the commissioning plan. Fast guide (tip-tilt and focus) with the OIWFS. Note that during the few hours with good seeing we verified that the fast guide with the OIWFS has an acceptable performance under IQ=85%. We have pending the tuning of the AO corrections. Full guiding (fast + AO) with PWFS2. Spectroscopic observations of extended objects through the 3-pix slit, 6-pix slit, and 8-pix slits with the JH and HK grisms. Spectroscopy of point sources objects through the 3-pix slit, 6-pix slit, and 8-pix slits with the JH and HK grisms. The expected down time is between two to three weeks. So we still expect to have FLAMINGOS-2 available for the start of its commissioning run at the end of April. 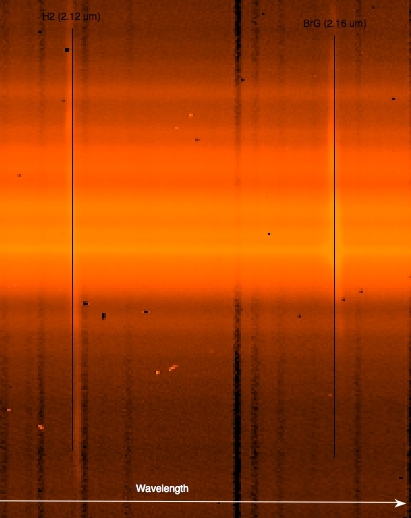 A previous uncontrolled cool down of the Hawaii-2 detector while powered has created an excessive number of charge traps leading to excessive hot pixels. In addition, the readout noise has changed. We expect to correct these issues with a warm up of the detector to room temperature. The MOS wheel mechanism started to stall. We need to warm up the MOS dewar in order to inspect and fix this mechanism. We have performed an initial assessment of the imaging performance of F2. At the best focus on-axis, we obtain fwhm ~ 0.35 arcsec for pinholes located within a radius < 0.5 arcmin, and fwhm 0.44 arcsec for the region between 2 to 2.5 arcmin. The following plot shows the image quality as a function of radius. We also show, as reference, the limits for the image quality (IQ) constraints of 20%, 70%, and 85%. We are still evaluating the effects of the IQ on spectroscopy mode. Please take these values into consideration for the 13B proposal cycle. 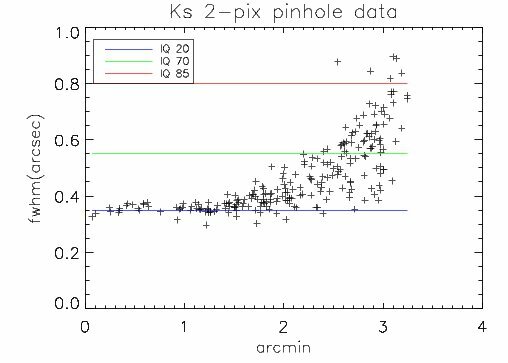 This plot shows the radial profile of the fwhm for a Ks 2-pix pinhole. We also show the limits for the IQ conditions: 20%, 70%, and 85%. The instrument is now mounted on the flex-rig to undergo further tests. After this, the instrument will be installed on the telescope so that we can start its commissioning in late April 2013. Extensive re-alignment work has been done on the instrument. At this time, the excessive coma and astigmatism present in the January images has been almost eliminated. However, the current PSF is not yet optimal and we continue to work improving it. We plan one more lab cold cycle in late March before starting the commissioning in April. The R3K grism has been re-installed in the instrument. We have extracted and masked the damaged region of the replica transmission grating. Moreover, we are planning to purchase a new R3K grism in the next months. The instrument was cooled down in early January 2013 after a 10 month shut down period. During this time, we worked on: modifying the lens holders for the entire camera and the field lens, installing a new field lens, installing a new window cover, installing a new detector board for the current Hawaii-2 detector, re-aligning the OIWFS, improving the thermal shielding of the camera dewar, and performing a first check of the overall optical alignment of the F2 optics (lenses and detector). All mechanisms worked as expected including the Hawaii-2. The mechanisms were exercised and we even performed a limited flexure test that showed no new issues. One issue that we still have to work on is the overall optical alignment of the camera. The images obtained during this first cool down present excessive coma. We are in the process of improving the alignment so that we can perform new tests during the next cool down in February. We also discovered some damage on the surface of the grating of the resolution 3000 grism (R3K). The grism cell was removed from the instrument in order to examine it and avoid further damage. We have contacted the vendor and the manufacturer so that they can help us to determine the reason for the damage. Then, we will decide what steps to take in order to be able to have a R3K grism available as soon as possible. A new cell holder for the Collimator lens (L1) has been received at Cerro Pachon. The thermal properties of this new cell holder will be tested by installing the original, broken lens within it (the lens will be glued). After this baseline test, a set of tests will be carried out with the new holder and the new L1. The new L1 lens arrived at Cerro Pachon in mid-August. During the shutdown, stresses in other lenses, located in the camera, have been uncovered. These stresses are consistent with point contact on the radial rods due to tilt arising from decentering during cool-down. Two of these lenses are being replaced. In order to minimize the risk of another lens fracture, the way all the camera lenses are held will be modified. The required modifications are minimal and are aimed solely at reducing stress without incurring additional delay. They will be implemented while the new L1 assembly is tested and the OIWFS is realigned in the MOS dewar. We remain on schedule to be on the sky no later than mid March 2013. As a result of the KP root cause analysis, Gemini has designed a different setup to hold L1. 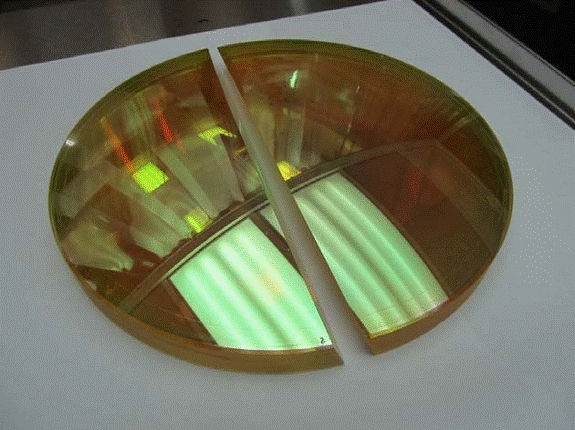 Several thermal cycles were performed on the MOS dewar in order to understand the temperature behaviour of the L1 lens and its holder. For this, we used the original L1 lens holder and a "glued" L1 lens fitted with temperature sensors. Moreover, we contracted Quartus Engineering to perform a FEA of the original L1 lens holder under warm, cold, and thermal changing conditions (i.e., thermal cycles of the MOS dewar needed for mask changes). The new design has been revised by internal and external experts including Quartus Engineering. This new design incorporates the lessons learned from the FEA and the results of the thermal cycles tests. The main feature of the new design is a dramatic reduction on the mechanical stress experienced by the L1 lens under all operational conditions. The new design will recycle the current hardware but change the way the lens is supported radially and axially. This new holder is now ready to go in fabrication. A new L1 Calcium Fluoride was received at Gemini South on July 11 and a spare is expected to ship from another vendor by the end of July. Those lenses have their sides polished to decrease the internal stress left over by the fabrication process. A new Hawaii-2 fan out board has been installed and tested. This new board includes some improvements designed to minimize the risk of possible delamination and improve the thermal control of the detector. Build a new L1 cell with a stress reducing design. Retrofit this design if possible for the other lenses. Polish the new L1 lens edge to relieve internal manufacturing stress. Review and improve the cool-down and warm up processes to avoid future occurrences of the problem. On February 3rd, while doing routine tests, we discovered what appeared to be vignetting in the FOV (see below). 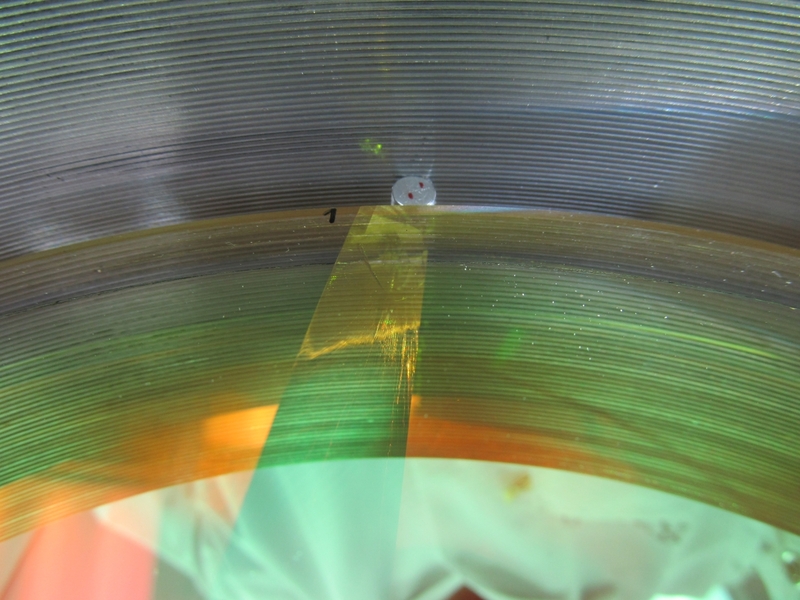 Further inspection revealed the cause to be a major crack in the large collimator lens ("L1"). Figure 1 (left) Diagram showing the location of the collimator lens. (right) K band image showing the apparent vignetting covering half the FOV. The windmill pattern visible is produced by the window cover shutter. Figure 2. This is the cracked lens. By the time the instrument had been warmed up, the crack had propagated across the entire diameter. Two replacement collimator lenses have been ordered, from two different vendors. A new lens holder is being designed. We are consulting with internal and external experts in order to validate this new design. We continue our analysis of the root cause of the lens failure. Based on our measurements of the size of all as-built parts and forces of the springs, our preliminary analysis focused on calculating the tensile stresses created on the lens at the contact points of the two radial defining rods (see the figure below from a report by G. Perez at Gemini Observatory).We find that the analytical calculated tensile stress on the glass is over 5000 lb/in2. 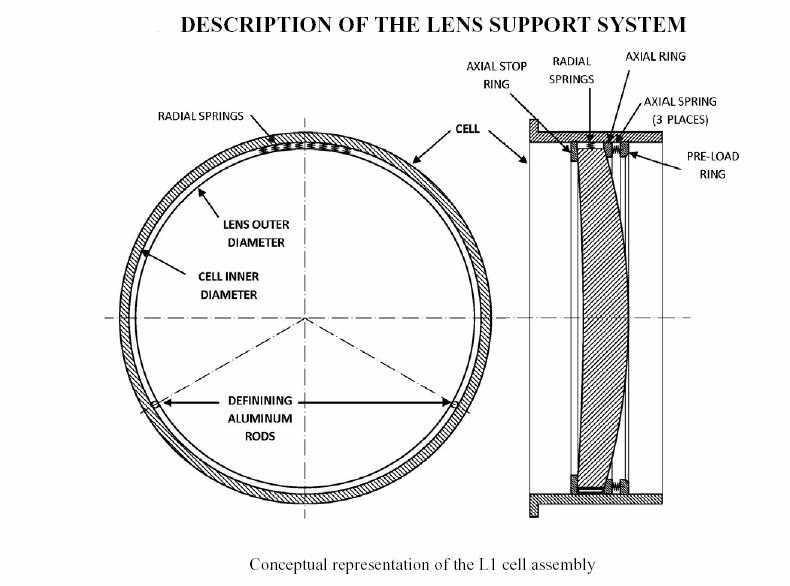 The picture above shows the lens inside the lens holder prior to disassemble (compare with the previous diagram). The bottom picture shows the location of the radial defining rod and the crack in the lens. Because of the uncertainty in the planned schedule to get back on the sky, we are not able to offer F2 for regular use during 2012B. Nonetheless, we are working toward making the instrument available to the science community as soon as possible. If we maintain this initial schedule, we anticipate expanding the System Verification phase to maximize the earliest opportunities for science. Please check this page periodically for frequent updates about FLAMINGOS-2.